Three years having passed since I created their previous site, Planning Ventures contacted me to discuss a complete redesign and rebuild. Their business had grown in this time, including Julie (who started the business) taking on Lyn Jones as business partner. Things move quickly in the WordPress web world and their current site was looking outdated and didn’t now reflect their larger business, or work hard enough in terms of content. Firstly we met to discuss number of pages, page content and preferences on site structure and WordPress themes. Then, I began to design the site, firstly creating wireframes of each key page for sign-off, so the client could get an idea of the structure and site navigation. 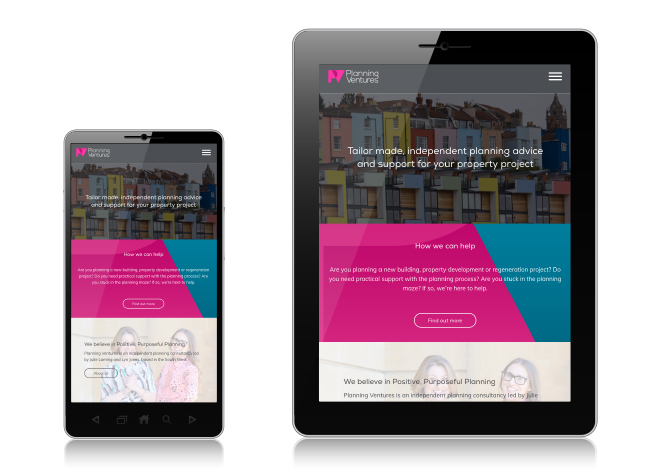 The next stage was to meet with David Smith of Made Responsively, who I had commissioned to do the site build. I ran through the wireframes to spot any potential trouble areas before embarking on the full page designs. Once David was happy, I began designing the pages – using a combination of Adobe Illustrator and Photoshop. Here I could properly look at the use of on-brand colours, typography and imagery. 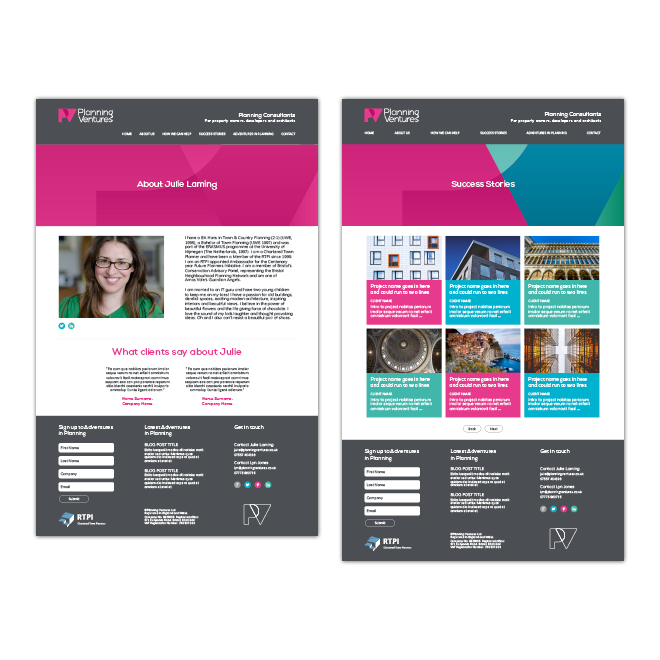 These flat visuals were then sent to the client for sign off before supplying to David for build into the offline test site. Flat designs for ‘Home’ and ‘About Planning Ventures’ pages. Flat designs for ‘About Julie’ and ‘Success Stories’ pages. I find the hardest stage of a website build comes at the end stages. Once the test site is built, it takes a careful process of comments and snag lists from client, designer and web builder to get the pages working just right. This included checking everything looked just right when viewed on smartphones and tablets, as well as desktop machines for this responsive site. Finally, we organised to meet with David at Made Responsively for an hour’s Wordpress training with the client. It’s key that the client knows how to update basic areas of the site, such as the blog, which they'll need to do on a regular basis. Having been with Planning Ventures from the start, Christian has proved invaluable to us once again. More than a refresh but not a rebranding, Christian has taken Planning Ventures’ website forward and given it a fresh, modern look. Keeping Planning Ventures identity, ethos and need for visual creativity, in what can only be described as a rather dull and bureaucratic industry, at the core of the redesign was vital to us. The website needed to stand out and stand proud from the ‘planning’ crowd and it does.